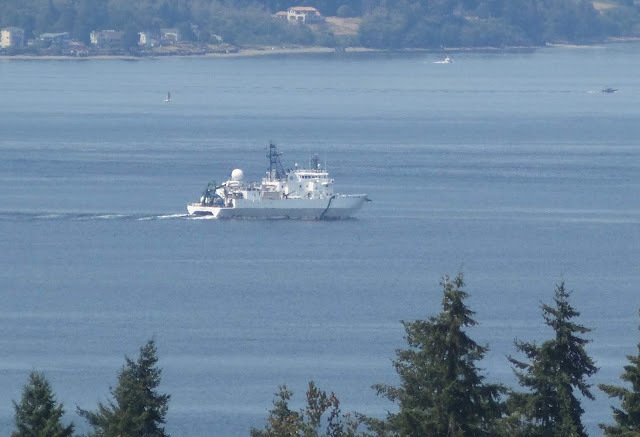 The research vessel, Kilo Moana, is a 186’ Small Waterplane Area Twin Hull (SWATH) vessel owned by the U.S. Navy and operated by the University of Hawaii Marine Center. Because of the unique SWATH design, the Kilo Moana is a very stable and comfortable platform from which to conduct oceanographic research. Kilo Moana is short for “oceanographer,” but literally means "one who is looking for understanding of the deep sea" in Hawaiian. The vessel can accommodate up to 20 crew members and 28 scientists. With a full complement of scientists and crew, the Kilo Moana can remain out at sea for 50 days and travel at a maximum speed of 15 knots. The Kilo Moana possesses an innovative and unique hull design called “SWATH,” which stands for Small Waterplane Area Twin Hull. Built like a pontoon boat/catamaran hybrid, the ship is broader than other ships, offering a smoother ride, a large working deck area, and stable operations even in rough seas. The vessel is equipped to perform a variety of general oceanography and multidisciplinary studies. There are eight laboratory spaces on board the ship, including hydrographic, chemical, and wet labs, as well general laboratory and computer spaces. Scientific equipment available for use on the Kilo Moano include a gravity meter, magnetometer, a piston core, and a rock saw to conduct marine geology and geophysical experiments. Instruments such as fluorometers and a Conductivity-Temperature-Depth system can be used by scientists to analyze seawater. The R/V Kilo Moana also has many advanced technological capabilities for studying the ocean floor. These technologies include multibeam sonar seafloor mapping systems that have been integrated into the ship design. Arrays of sonar transmitters and receivers are located along the bottom of the port hull. These systems are designed to gather data in shallow and deep water areas, allowing a complete range of mapping coverage from nearshore to the deepest depths of the world’s ocean. The ship’s deepwater multibeam echo sounder is capable of hydrographic charting and seafloor acoustic backscatter imaging in water depths up to 11,000 meters, meaning the ship can map the deepest trenches on Earth. Another type of echo sounder on the Kilo Moana operates on the same theory as the the deepwater echo sounder, but with a higher frequency to allow better resolution in waters up to 1,000 meters. The aft portion of the Kilo Moana main deck is configured to carry, launch, and recover equipment for a variety of oceanographic operations at sea, including coring, water sampling, equipment launch and recovery, and array and trawl towing. Two cranes and a winch are available for the launch of such equipment.